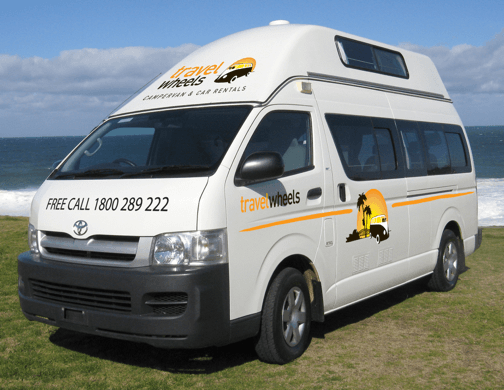 Travelwheels Campervans offers great value for money automatic campervan hire across Australia. Give us a call on 0412766616 for our lowest rates on Automatic campervan hire! First of all, our automatic campervan rental vehicles have plenty of space for up to five people. It has a larger fridge, more space in the lounge and by the way the beds are bigger too! In addition it also comes with an extra tent just in case anybody snores loudly! Take a look inside our 5 person automatic campervan, and you will be surprised how many features we have squeezed into our automatic campervans. These 5 person automatic campervan hire vans have a great kitchen and living area. For instance you will notice they have more head and leg room inside these campervans. Coupled with the comfy layout means you will enjoy your campervan hire holiday with Travelwheels. For example check out the video below of our 5 Person automatic campervan. You will see the great kitchen layout and just how much room we have inside this campervan. 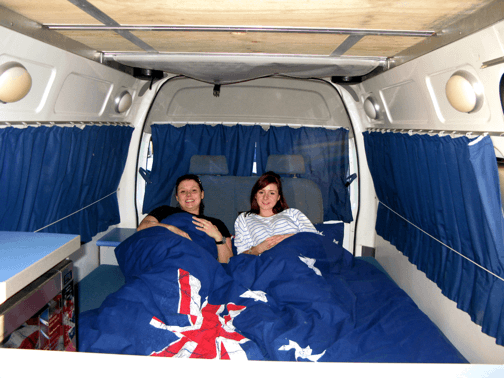 Automatic Campervan Hire – large double bed for good night sleep! As a result of a larger cabin area, hence these 5 person automatic campervan hire vans have larger beds! According to some of our customers they really enjoyed spreading out in the beds! For example, this is the perfect automatic campervan for anybody who is tall! 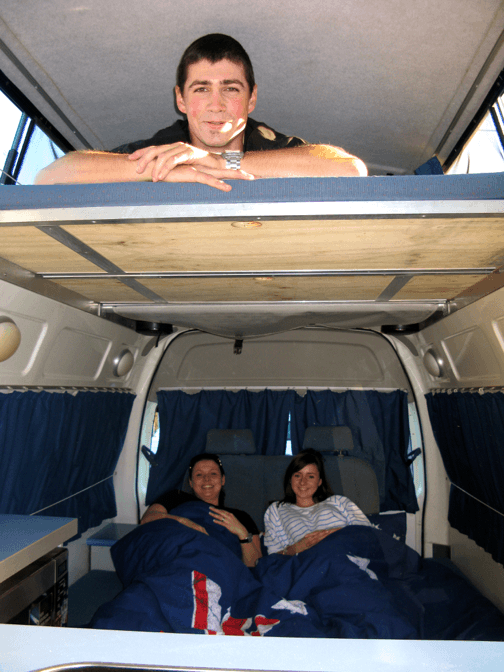 Together with the larger beds, these campervans are great if you like three or maybe four in the bed! Are you looking for automatic campervan hire in Australia? In this case, then give our campervan hire team a call on 0412766616 for our latest specials! Wir sprechen Deutsch and nous parlons Français! We price match on all Sydney to Sydney automatic campervan rental deals! Therefore give us a call or enter your dates into our campervan hire Australia price comparison checker. These Automatic campervan hire vans are very popular with our Australian, New Zealand and American customers. For the most part many of the drivers from these countries learn to drive automatic transmission vehicles. Therefore this automatic campervan is perfect for them In addition to this model, we also have a 2 Person Automatic Campervan for hire and these are especially suited for couples or two friends. In addition to this, they are brilliant for families with small kids as these automatic campervans meet new Australian child seat belt laws. 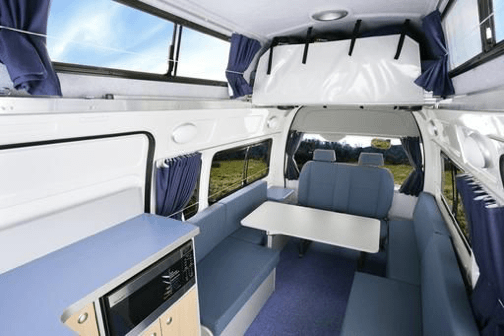 These 5 person automatic campervan hire vans have loads of space inside! 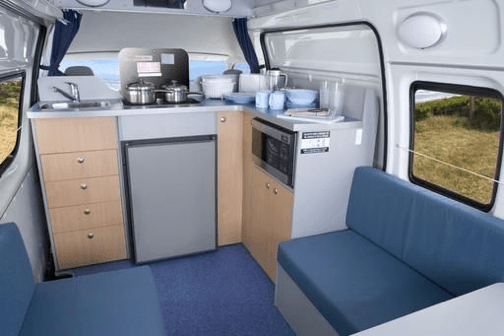 For example, the kitchen or lounge area has plenty of space for entertaining and afterwards cooking up a great meal in this campervan. 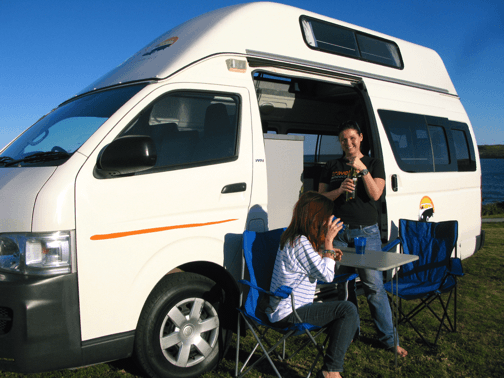 Here are some tips from a fellow traveller explaining how to survive living in a campervan in Australia! Automatic campervan hire + Large fridge and more room inside! These Automatic campervan hire vehicles from Travelwheels are much bigger than our popular 3 person campervans for hire. They have more room inside and a different kitchen layout which makes entertaining a lot of fun! Cups, Glasses, Saucepans, Frying Pan, and Kettle. The great thing about these 5 person automatic campervan rental vans is the amount of space you have in the lounge area! There is plenty of room for everyone to sit around the table and enjoy a bottle of wine or two in the back of this automatic campervan! This is a great space to entertain and enjoy the freedom of a travelwheels campervan hire holiday in Australia! Automatic campervan hire with 2 Double beds! Another positive thing about this Travelwheels Automatic campervan hire vehicle is the size of the beds! For instance, the bottom bed is huge and more than enough space to get three in a bed if you are lucky! Here is the size of the large bottom bed which is 2.1m long x 1.7m wide! Automatic campervan hire + 2 double beds! In addition to the large bottom bed, the top bed is big enough for two adults! Furthermore kids absolutely love climbing the ladder and sleeping upstairs! This is one of the reasons why these Travelwheels Automatic campervan hire vans are so popular with families! The top bed is big enough for two adults and the size of the bed is 2m long x 1.37m wide. 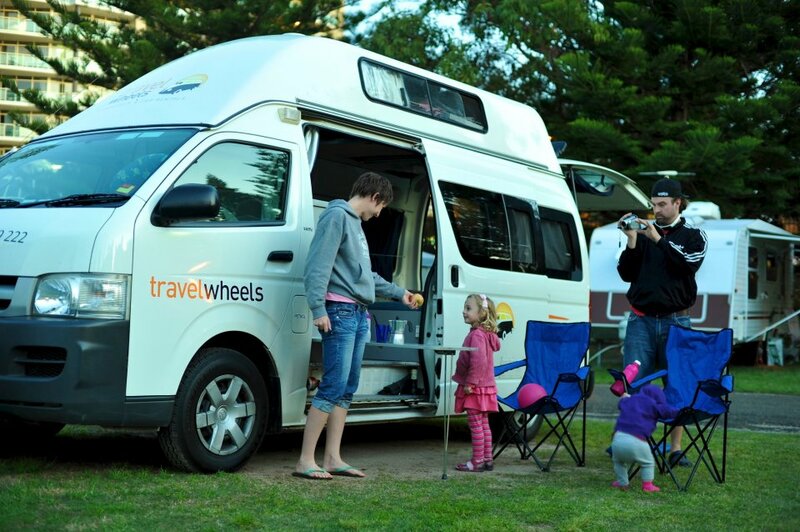 This Travelwheels 5 Person campervan is great for families. Consequently there is also plenty of room for two couples or a group of friends who want a spacious and comfortable campervan hire with automatic gearbox. This campervan comes with five camping chairs included in the price! Remember not to leave them down at the beach when you drive off in the morning! It also has a fold out outdoor table that connects to the side of the campervan to relax in the sunshine! The 5 Person Automatic campervan is Travelwheels Campervan Hire Australia largest model we rent in Australia. It’s very good value for money, fun to drive and plenty of space for families or a group of up to 5 friends. Planning a trip to Australia and furthermore not sure where to go? 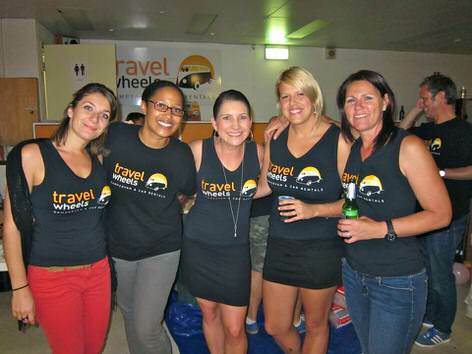 Travelwheels campervan hire staff members has lots of free Australian route planners with helpful tips. For example we have guides to Australian weather, maps and travel itineraries to help you have a great campervan hire holiday in Australia! These trip planners are available in English together with Deutsch, Français, Nederlands versions and all for FREE! Another good site for example with travel tips for Australia is www.australia.com website. Here is a link from them about tips on planning a holiday in Australia. 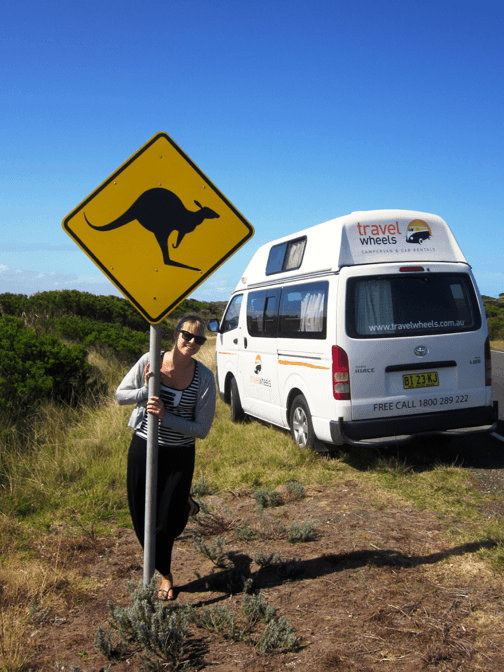 Automatic campervan hire – great way to explore Australia! 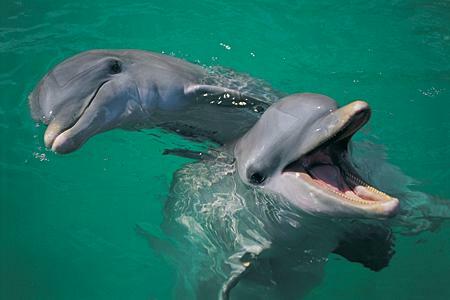 Another popular Automatic campervan hire trip is Sydney to Jervis Bay to go and see the dolphins! Remember to also go and check out Hyams Beach which is in the Guinness Book of Records as having the whitest sand in the world! Here is our free guide with driving directions from Sydney to Jervis Bay to help you plan your trip. Jervis Bay is home to lots of Dolphin tours and also very close to the beach with the whitest sand in the world (See Guinness Book of Records). Travelwheels Campervan Hire Australia have some great specials on automatic campervan hire. Free free to email us below or contact us here. Our friendly staff will get back to you with a good value for money campervan hire quote. You can call our team on 0412766616 in Sydney for our best deals on good value for money campervan hire. Lastly, our automatic 5 person campervans for hire have been specifically made to meet the new strict Baby Seat Belt Laws in Australia. The 5 Person Automatic campervan can accommodate TWO BABY SEATS (three years and under) or TWO BOOSTER SEATS (minimum four years or older). It has two anchor points installed for two children under the age of four. By the way, this campervan can not accommodate a baby capsule 0-1 year old child. The child seat belt anchor points are located at the back of this campervan hire in the lounge area. NOTE – baby seats cannot be installed in the front cabin. NOTE – Baby or Booster Seats must be pre-booked in advance in order to ensure we meet the new Australian Campervan Hire Child Seat Belt Laws. Please can you advice our reservations team on the age and weight of your child/children when booking this popular family Automatic campervan hire. They have two anchor points installed for two children under the age of four. Subsequently it is important to note that this campervan can not accommodate a baby capsule 0-1 year old child.